Now that it's fired the man who nearly destroyed its reputation, the company behind The Avenger controller accessory is taking a lot of good steps to clean up the mess. The saga of stupendously inept PR goon Paul Christoforo seems to be winding down, now that he's been clobbered with the Collective Beatstick of the Internet and proved that he's not sorry for his actions. 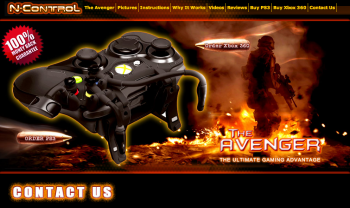 Unfortunately, Christoforo's horrible emails managed to poison the reputation of the product he was representing: The Avenger Controller accessory. Now, the company behind the device is scrambling to distance itself from the man who managed to singlehandedly anger countless Web users. N-Control, the maker of the Avenger, is off to a good start. It's announced the termination of its relationship with Christoforo and has hired a new consultant to handle marketing and customer relations, MoisÃ©s Chiullan. Chiullan's off to a good start, noting that N-Control can't afford to dwell on what Christoforo did. Instead, the company needs to look forward and work on making things right. â€¢ Contrary to some rumors, Christoforo does not own N-Control, nor is he working for the company under another alias. The man has been summarily booted out into the proverbial cold. â€¢ N-Control had no knowledge of how Christoforo was handling customer service on its behalf. Also, the company is creating a new system where management will observe customer service email interactions. Finally, "N-Control regrets sincerely that the trust they placed in Mr. Christoforo was so abused and betrayed." â€¢ The PS3 version of the Avenger is now scheduled for a January 15th shipping date. Updates for individual orders are expected to be sent out soon. â€¢ The $10 discount that was mentioned in the initial email exchange between "Customer Dave" and Christoforo will be extended to everyone who has pre-ordered the PS3 version of the Avenger (though if you've already received the discount, you won't receive another $10 off). â€¢ "At no time during his tenure with N-Control did Mr. Christoforo have direct access to customer credit card information. N-Control does not retain any customer credit card data for online orders, which are all processed via Google Checkout or Paypal." â€¢ Eli Schwartz, who identified himself as N-Control's Marketing Manager earlier this week, is actually a part time social media consultant with the company. Schwartz is actually still in high school and gave himself the title without checking with the company's management for approval. The Avenger seems like it's actually a pretty decent product, based on the positive press it received before Christoforo's boorish emails led to it being review bombed on Amazon. Hopefully, the company is able to survive the blowback, but it's hard to measure the damage so far. According to Chiullan, who I exchanged a few emails with, this is because order cancellations come in to the same account that currently has over 16,000 emails in it (most of which are complaints about Christoforo himself, apparently). Chiullan did reveal, though, that a number of new orders for the Avenger have come in since the initial story broke. "We have to move forward and take care of Avenger's customers. I can't worry about the fact that there isn't a bus big enough for me to throw Paul Christoforo under. The internet did that for me. I think they set him on fire too." Um. You officially have my endorsement as an improvement over your predecessor, Mr. Chiullan. UPDATE: Apparently Christoforo isn't finished kicking up controversy. The new N-Control Twitter account has revealed that the man is apparently claiming David Kotkin (the founder and inventor of the Avenger Control) has forgiven him; this is not and never will be the case. Also, it turns out that Christoforo is holding N-Control's old email and social media accounts hostage. When I asked Chiullan about this, he explained: "[Christoforo] has administrator access to the master account, as well as the server that the website is hosted on and the company's (previous) official Twitter account, and has not relinquished that access, blaming his outsourced tech team." Paul Christoforo, ladies and gentlemen.